The latest Amazon Underground APK is coming with the new version 8.9.1.200. You surely know the Amazon as a giant company engaged in the field of e-commerce and cloud services. After the Fire Phone sales are not as expected, Amazon seems to still want to have contributed to utilize the Android platform. Their newest effort is by launching the Amazon Underground for Android. It is an Android application that provides a portal application that is totally free. Some of the Android users may often feel annoyed with a free application, but in it is still subject to in-app purchase. You still have to take a long time just to upgrade the building or buy a sword with super powers. Amazon promises even in-app items are actually free. To replace the in-app purchase, Amazon pays the application developers so that users can enjoy a wide range application for free. The new business methods are offered by Amazon for application developers are so much different than other applications. Amazon will pay a certain amount based games or applications that run every minute. This is why Amazon bold tagline “Actually Free” at the launching. Underground Amazon has an interface similar to its online store. The difference is this application is only available for Android smartphones only. Some popular games can be found such as Cut the Rope, Pudding Monster, Star Wars Rebel, Angry Bird Stella, and so forth. Similar to Mobogenie and 1Mobile Market, the downloaded file has an extension .apk. After downloading, you can install and ready to run the application on your Android smartphone. For some mobile gamers, Amazon Underground for Androidsuch as black market that makes paid application into a free. You can perform in-app purchase without having to spend any money. Now you can upgrade all sorts of features that exist on your favorite games without having to wait for a long time or pay with a credit card. 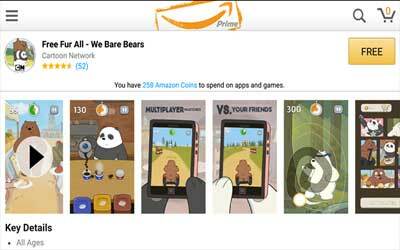 Initially, android applications offered on the Amazon site at the tab “Free Games of The Day”. However, it is made to replace the feature. To download and install it, you cannot get in Google Play Store. But we have mirrored it. Unfortunately, for the moment Underground Amazon can only be enjoyed in certain areas only. In the meantime, Amazon still imposes region restrictions to access this application. With the “Actually Free” feature that offered, this application could be one alternative apps store besides Mobogenie, 1Mobile Market, or Google Play Store. The new version has been improved so you can download and install this app for the best performance.